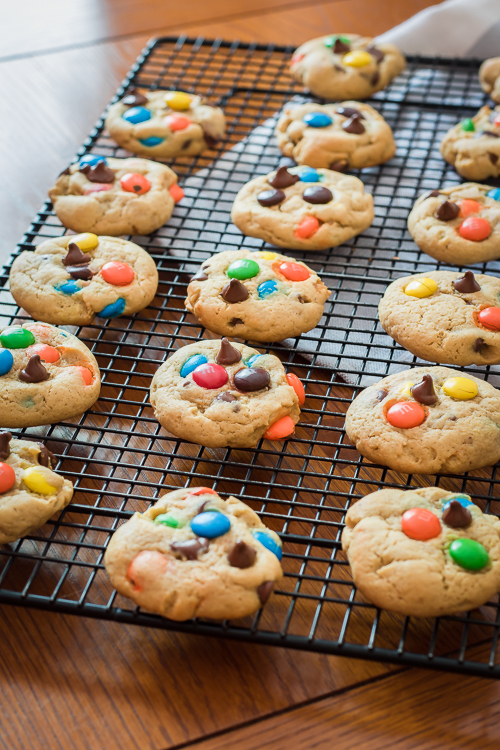 Peanut Butter M&M Cookies, basically the best M&M cookie recipe there is. Trust me. Our classic cookie base is kicked up a notch with the addition of peanut butter. Now, I know what you’re thinking, these will be overwhelmingly peanut butter-y. But they aren’t! The peanut butter in this cookie batter is light and subtle and just gives it that extra oomph. 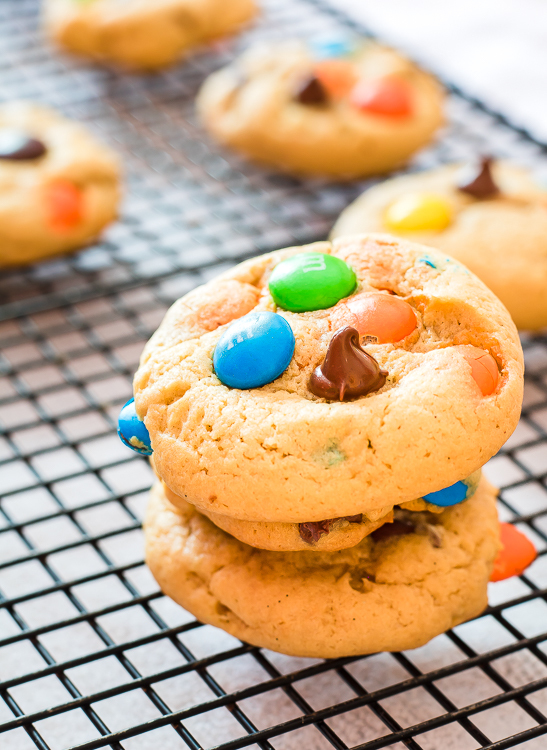 Plus, with that peanut butter addition to this M&M cookie recipe makes these cookies not over sweet. I know! A cookie with M&M’s and chocolate chips not being overly sweet? It just works. A touch of that salty peanut butter is divine in these cookies! Some of my best childhood memories revolve around a kitchen. I think a lot of people grow up with a sweet spot in their heart for home baked cookies like these! 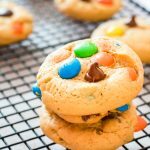 This m&m cookies recipe from scratch will brighten up anyone’s day and it’s the perfect recipe to get your little ones helping out in the kitchen! Believe me, they will take this memory with them throughout their whole life. So, get those kiddos involved and bake up a batch! 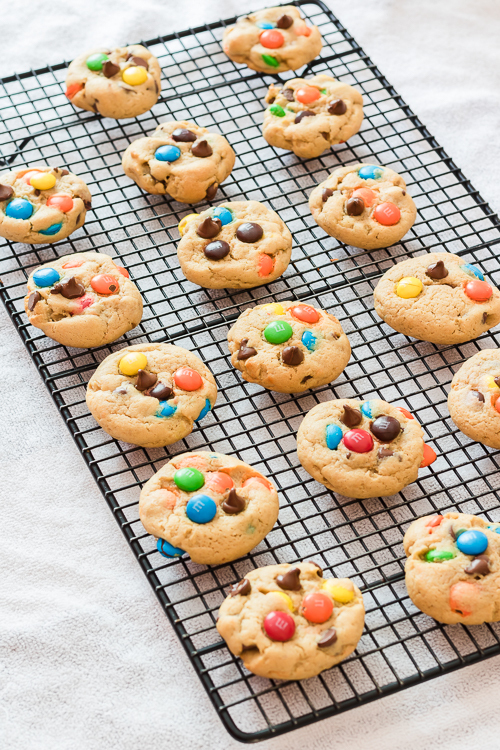 I think the perfect job for your little one is to add the additional M&Ms and chocolate chips to the tops of the cookies right before baking to make them extra pretty, I know they love to decorate! I really hope you liked today’s recipe and you are inspired to get baking! We have a ton of great dessert recipes. Please visit my blog, ThisSillyGirlsKitchen.com for even more yummy recipes! Sift flour, baking powder, baking soda and salt in a bowl. Set aside. Cream butter and peanut butter together for 3 minutes in the bowl of a stand mixer on medium speed. Add sugars with the mixer running on low. Turn speed up to medium high and beat for 2-3 minutes until fluffy and light in color. Add eggs one at a time, incorporating the first egg fully before adding the second one. Add vanilla and milk and mix on low until incorporated. Add flour mixture and mix on low until just incorporated. Don’t overmix the batter, you don’t want dense and tough cookies. Preheat the oven to 375F. (Here you can add additional M&Ms and chocolate chips to the top). Bake cookies for 8-10 minutes until slightly brown. Don’t overbake them, there is nothing sadder in life than an over baked cookie! 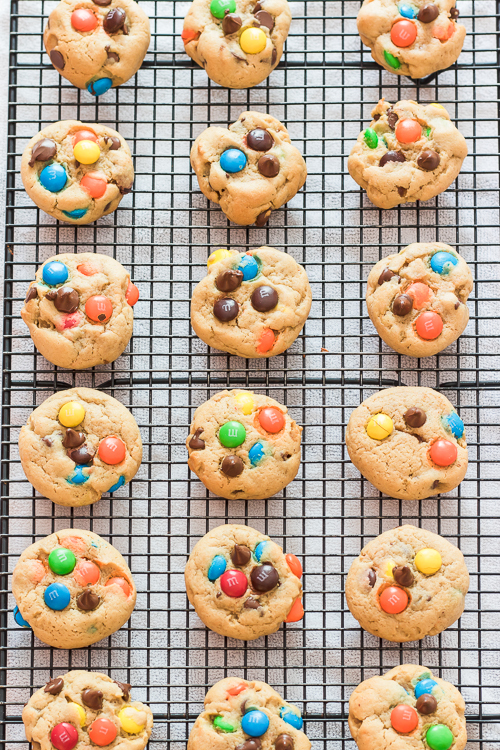 Right before baking, place a couple M&M's on top of each cookie to make them look prettier.